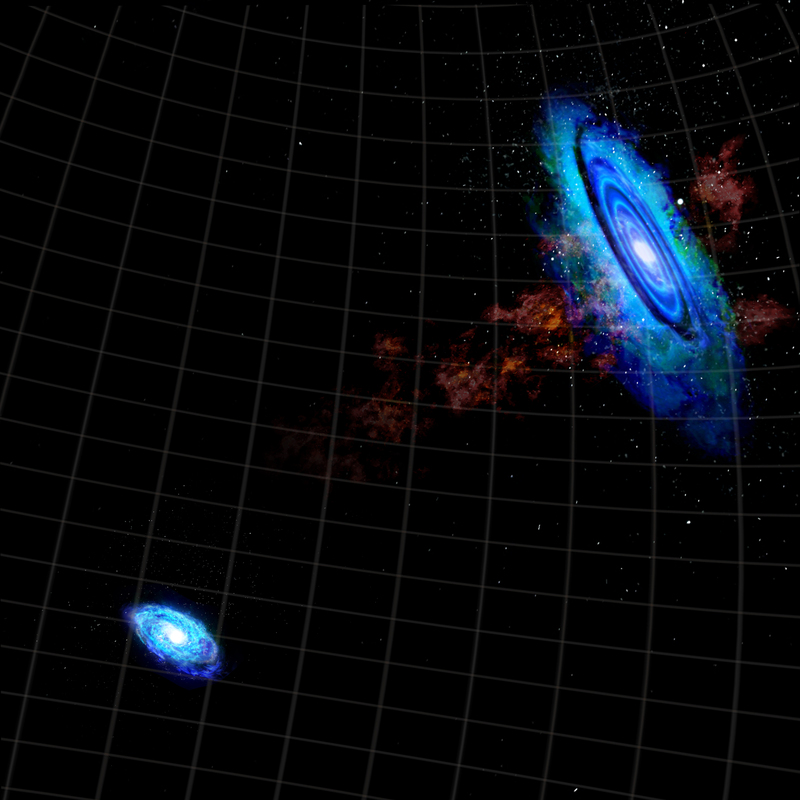 Two of our Milky Way's neighbor galaxies may have had a close encounter billions of years ago, recent studies with the National Science Foundation's Green Bank Telescope (GBT) indicate. The new observations confirm a disputed 2004 discovery of hydrogen gas streaming between the giant Andromeda Galaxy, also known as M31, and the Triangulum Galaxy, or M33. Graphic shows gas "bridge" between M31, right, and M33. "The properties of this gas indicate that these two galaxies may have passed close together in the distant past," said Jay Lockman, of the National Radio Astronomy Observatory (NRAO). "Studying what may be a gaseous link between the two can give us a new key to understanding the evolution of both galaxies," he added. The two galaxies, about 2.6 and 3 million light-years, respectively, from Earth, are members of the Local Group of galaxies that includes our own Milky Way and about 30 others. The hydrogen "bridge" between the galaxies was discovered in 2004 by astronomers using the Westerbork Synthesis Radio Telescope in the Netherlands, but other scientists questioned the discovery on technical grounds. Detailed studies with the highly-sensitive GBT confirmed the existence of the bridge, and showed six dense clumps of gas in the stream. Observations of these clumps showed that they share roughly the same relative velocity with respect to Earth as the two galaxies, strengthening the argument that they are part of a bridge between the two. When galaxies pass close to each other, one result is "tidal tails" of gas pulled into intergalactic space from the galaxies as lengthy streams. "We think it's very likely that the hydrogen gas we see between M31 and M33 is the remnant of a tidal tail that originated during a close encounter, probably billions of years ago," said Spencer Wolfe, of West Virginia University. "The encounter had to be long ago, because neither galaxy shows evidence of disruption today," he added. "The gas we studied is very tenuous and its radio emission is extremely faint -- so faint that it is beyond the reach of most radio telescopes," Lockman said. "We plan to use the advanced capabilities of the GBT to continue this work and learn more about both the gas and, hopefully, the orbital histories of the two galaxies," he added. Lockman and Wolfe worked with D.J. Pisano, of West Virginia University, and Stacy McGaugh and Edward Shaya of the University of Maryland. The scientists presented their findings at the American Astronomical Society's meeting in Anchorage, Alaska.